Cats unfairly have a bad reputation for their seemingly haughty demeanors and icy personalities. Human beings tend to anthropomorphize and they ascribe traits associated with aloofness to cats. While many of these feline traits may indeed be indicative of a cat’s desire to be alone, we miss so many signs of their enduring love for us. Close, But Not Too Close! Does your cat like to be near you? Perhaps she often sits next to you or she’ll recline on the back of the sofa while you’re watching TV. She likes to lay at your feet while you’re eating dinner or sleeping in bed. These are tell-tale signs of her affection for you. Even though she may not like being held or cuddled, her need to be close to you is a token of her trust in you. At these times, you can gently caress and stroke her but watch for signals that she has had enough. Another small but significant sign of affection is head-butting. When you reach your hand out to pet your cat, she may rise on her hind legs and meet your hand with the top of her head. She may also entwine herself around your legs and rub against them with her head and ears. Her forehead’s glands transfer her scent to you. She is, in a sense, marking you as her human. Rough play is a sign of affection from cats younger than two years old. They may like to “attack” your hand or jump on your legs while you’re walking. 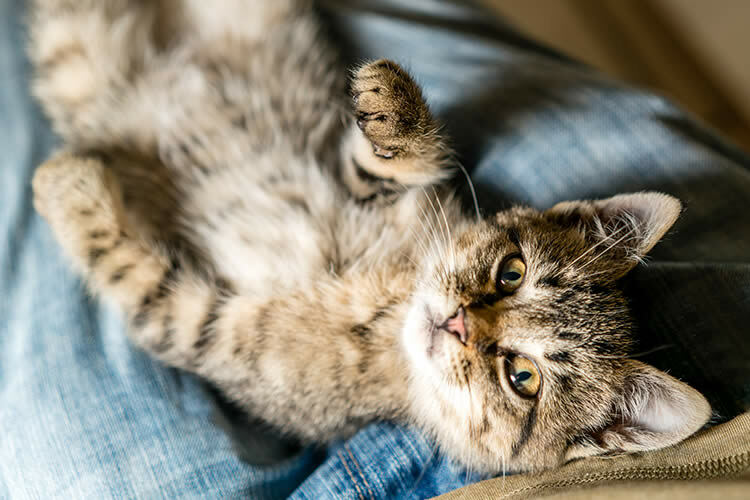 This is not aggression – it is the same type of play that kittens engage in with their littermates. However, you should learn to differentiate between a cat who is irritated with you and a cat who is trying to show love. If you are smothering your cat too much, she may act out by scratching or biting you. Although it may seem that your cat doesn’t care if you are present, she is very dependent on you for her physical and emotional well-being. Cats don’t display their neediness by jumping up and down and wagging their tails when you come home from work. Instead, they follow you around the house, trailing behind you, intently observing everything you do. What Is “I Love You” in Cat-Talk? Cats are vocal for all kinds of reasons – not only to call on potential mates. When your cat speaks to you, her “words” will be short and sweet. Her sounds may sound like questions or reprimands and will be repeated in small and brief intervals. She may be hungry, she may want a treat, or she just wants to talk to you. In any case, it is a sign of her confidence that she can communicate with you and that you will understand her! True animal lovers hate to hear that people don’t like cats because they are too snobby. Or that people love dogs because of their unconcealed fondness for their human parents. To compare a dog to a cat is not only foolish but unreasonable. Cats are much subtler in their affections but make no mistake – they feel and love just as strongly as their canine counterparts. It is not their fault that some of us are not attuned enough to recognize their gestures of tenderness. No, cats are not dogs – and it is illogical to think that a cat should act like a dog. Cats don’t normally give you their uncompromising and overt adoration – their trust and love is often hard won, especially those cats you adopt as adults.